After living in Australia I am a self proclaimed coffee snob and since moving to Vorarlberg I have continuously been on the hunt for a good cup. After three months of clinging to our Nespresso machine at home I read about Cafesito. They have two cafes, one in Bregenz and one in Dornbirn. Down a side alley in the heart of Bregenz lies this small Bagel and Coffee Shop*. They have a few tables outside but more seating inside. As I arrived it was already pretty busy, which gave me chance to take in their menu which they have on a blackboard behind the counter. They have an extensive coffee menu catering to everyone’s tastes, whether you’re an Espresso drinker, more inclined to a Cappuccino or prefer a Mocha, Mochacino or even a Chai Latte. They also offer at an extra charge soy or lactose free milk. They even have Bio Hot Chocolate with added caramel or chilli if you so desire, or for tea lovers they also have a good selection. As it was a nice and sunny day they had a steady stream of customers opting for their variety of Smoothies and Frappes. Seeing some of bagels coming out of the kitchen I decided to also stop and have some lunch here. They have the classic cream cheese and smoked salmon on offer, but also a choice of salami, tuna and chicken to name a few. If you’re here early they also have sweet filled bagels, or fresh croissants to tempt you. 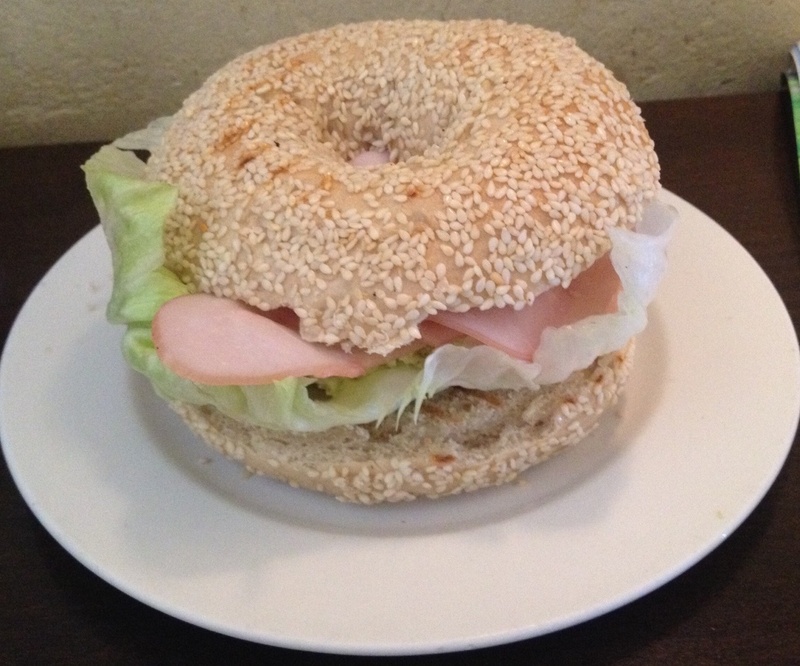 With a bagel of the week and a special on the menu, there is plenty to choose from. As I reached the counter I also saw the freshly baked goods they have on display like muffins, chocolate slices, and gluten free cakes. As I had arrived quite late on in the day they only had a choice of plain, onion or sesame bagels left, but if you get there in time the selection is bigger including vollkorn, dinkel and laugen bagels. As I placed my order my chosen bagel was taken to the kitchen and made fresh for me. I took a seat at a bench on one side of the cafe where they had a good selection of newspapers and magazines (both german and english) which was ideal for solo diners. My bagel was prepared quickly and came out w arm from being toasted. I had settled on a classic sesame bagel with cream cheese but with some added fresh tomato, basil and chicken. Taking my first bite it reminded me of a holiday in New York where I ate a bagel every morning, and after trying this one I’m pleased to report that I would be happy to eat these everyday. Picking up my Cappuccino to go I did not have high hopes based on previous coffee drinking experiences so far in Vorarlberg, but after my fist sip I was pleasantly surprised by the well made coffee which is roasted locally. To make sure my first impressions of this cafe were accurate a few weeks later I stopped into their Dornbirn branch. 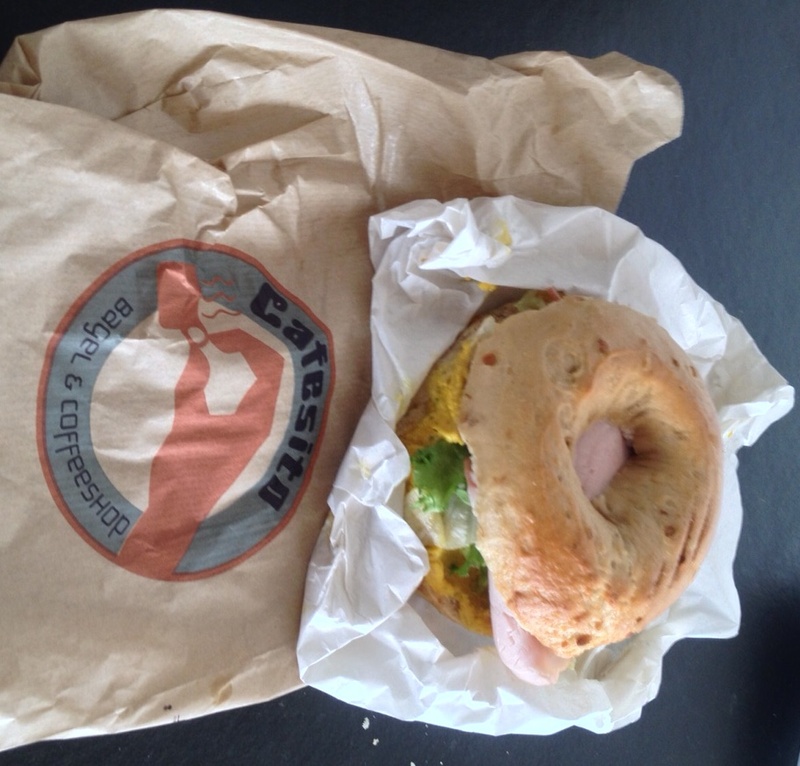 As it was a Saturday morning it was packed and so I go my Americano to go, along with an onion bagel with hummous. I had asked for a small amount of milk with my coffee and the barista came over and asked me to tell her when to stop as she added the milk to ensure she didn’t add too much for me. With only a small amount of milk this time I knew it would be true reflection of the quality of the coffee, and once again they exceeded my expectations and I thoroughly enjoyed my caffeine hit while I wandered around the Dornbirn market. I didn’t eat my bagel until I got home and it survived the commute well and the fresh bagel smell greeted me as I opened the bag. The hummous was delicious and a nice change to cream cheese, and because they add the salad after toasting the bagel it stays nice and fresh. So yet again another tick from me. Cafesito reminded me a lot of the many independent cafes that were opening up in the area I lived in in Sydney and it seems to have managed to keep that feel even in the bigger branch in Dornbirn. So if you’re looking for a relaxed urban cafe atmosphere, I would definitely recommend a visit. *NB: Cafesito Bregenz has now moved premises to a bigger two storey cafe, but still offers all of your favouries and more.